Horleys - Ripped Factors Fat Loss Protein for Serious Trainers. Every nutrient added to Horleys Elite Ripped has been carefully selected to support better results and optimise your health while you work towards your goals. L-Glutamine assists your body’s wellbeing during times of stress (such as intensive exercise or restricted diet programmes). It also supports your immune systemand also has an anti-catabolic effect (i.e. protects muscle tissue from being broken down for energy). Horleys Elite Ripped contains Black Pepper Extract (Bioperene), which increases the bioavability of other nutritional compounds, and also enhances your body’s natural thermogenic activity. Horleys unique thermogenic complex assists with fat metabolism, containing efficacious amounts of key ingredients that each has an impact at a different point along the metabolic pathway. Caffeine (from pure Caffeine, plus Green Coffee and Guarana Extracts) is a well-known stimulant that boosts your metabolic rate and increases mental alertness and athletic performance, to help you get more out of your workouts. Even 95mg of caffeine has been shown in studies to significantly increase metabolic rate. Green tea extract contains several catechin compounds, the most important of which is Epigallocatechin Gallate (EGCG). Human and animal studies have shown that green tea increases fat oxidation via an acute increase in thermogensis and by a more long-term increase in β-oxidation in the liver. Human studies have shown that green tea compounds and caffeine significantly increase 24 hr energy expenditure (calories burnt at rest). Carnitine (from Carnipure™, a superior pure source) is a fat mobiliser – a compound that moves fat into the mitochondria where it is burnt as fuel. 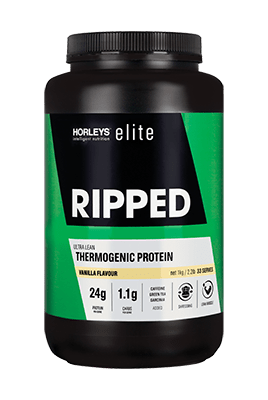 Horleys Elite Ripped is engineered using a proprietary triple-protein blend of NZ-made ultra pure Crossflow Microfiltered (MF) Whey Protein Isolate (WPI), Whey Protein Concentrate (WPC), and Calcium Caseinate (casein). We selected these sources of protein to offer the benefits of a full spectrum protein (all the essential amino acids your body needs plus beneficial bioactive components that support immune health, provide anti-viral properties and more), combined with a slow release peptide source for the ultimate combination. WPI and WPC are fast digesting proteins for quick delivery of amino acids for muscle recovery. Casein is digested slowly, delivering amino acids over a longer period, which is ideal for maximising muscle retention (so you can maintain that hard earned muscle while you lose fat). Offering you full nutritional support whilst you shred fat. The vitamins and minerals have been specifically selected to ensure you don't miss out on vital nutrient when cutting calories.